If you’re reading this story without realizing that there are spoilers ahead, that’s on you. Game of Thrones is not a series that has qualms with ending the lives of its characters, regardless of whether they’ve been there since the beginning or if they just showed up the previous week. Season 4 pulled off some of the most shocking deaths of the series, and the finale featured one that everyone knew had to be coming: the revenge-filled murder of Tywin Lannister (Charles Dance) at the hands of his son Tyrion (Peter Dinklage). But is it possible we haven’t seen the last of the Lannister patriarch? Speaking with MTV about Gary Shore’s upcoming fantasy drama Dracula Untold, Dance dropped one hell of a bombshell about his character’s future on the show. “Well, I’m not completely missing from the next series,” he said with a slight chuckle. “More on that, I’m not going to say. You haven’t seen the last of Tywin Lannister is all I’ll say.” Brainsplosion! Watch him share the news himself in the clip below. There are a few ways to look at this, and one of them is so much more boring than the others. Though Game of Thrones has held to a strict “no flashbacks” policy up until this point, perhaps they’ll make an exception. More likely, however, is that Tywin will appear in some kind of a dream sequence. Maybe Tyrion will be dealing with the grief over having murdered his father, or maybe his subconscious will be reveling in it. Perhaps the dream will itself be a flashback to one of Tyrion’s better memories of his father. All the possibilities! 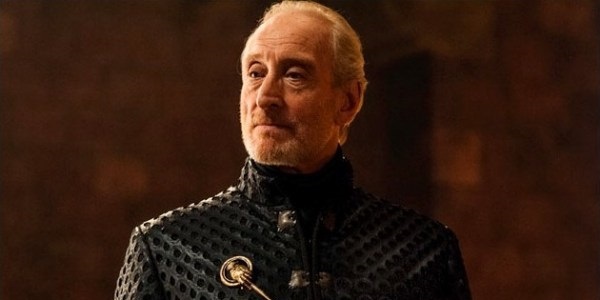 I hate to say this, but perhaps the likeliest of outcomes is that Dance will just be lying around for part of an episode as Tywin’s corpse during a well-populated funeral sequence. But I sincerely hope it’s something meatier than that; otherwise, why was he so cheeky about sharing the tidbit? I don’t know what audiences will do with so few dickface Lannisters running around for a whole season. Relive the most righteous patricide in the clip below. We already know we won’t be seeing characters like Bran and Hodor until Season 6, and that Jonathan Pryce and others have signed on to the show in recent months. What other casting surprises does Game of Thrones have in store?